A series of vignettes depict Myra and Lester settling down into the social whirl of 1950s San Francisco. Then ... First, celebrating the 30th season at the opera. ... and Now, the drawing on the brochure cover above is San Francisco's War Memorial Opera House, a grand Beaux-Arts building opened in time for the 1932/33 season. (From 1923 - 1931, the newly-formed opera company had performed at the Civic Auditorium). Below, the opera house today, at 301 Van Ness Avenue (map). ... but this isn't the War Memorial Opera House - archival footage filmed on stage 28 of the Universal Studios lot in Universal City, California was used instead. 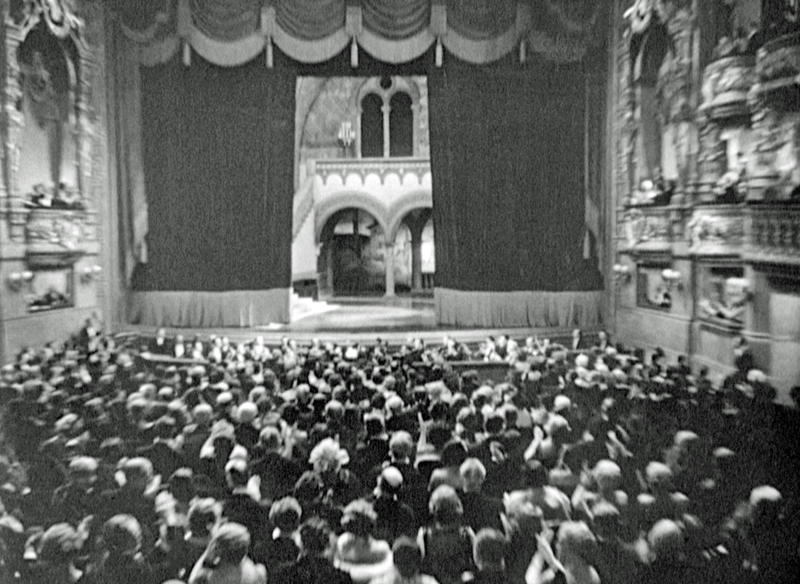 Originally built for the 1925 movie Phantom of the Opera (see below), the theater set has been featured in many movies over the years. Citysleuth thanks reader Paul Penna for pointing this out. (Update - The stage was demolished in 2014). ... and Now, the War Memorial Opera House interior is very different. Then ... Next up, a day at the races at Tanforan, the racetrack of choice for city high-rollers from 1899 until it burned down in 1964. It was located on El Camino Real in San Bruno, near the San Francisco International Airport (map). ... in 1950 ... The 1950 Bing Crosby movie Riding High was filmed at Tanforan racetrack and in this scene from it a huge sign, South San Francisco, The Industrial City, can be seen on the south side of San Bruno Mountain. ... and Now, with the racetrack gone a shopping mall, The Shops At Tanforan, has been built on the site. In this view across the mall from El Camino Real we see that the huge cement letters of the iconic sign, dating from the 1920s, are still there. The famous racehorse Seabiscuit used to practice at the Tanforan racetrack in the 1930s and shoppers today can see a memorial statue of it in front of the Barnes and Noble store at the mall. Then ... This double exposure shows the newlyweds swept up by the action down the home stretch. Note the oil derricks in the distance to the left - but this footage wasn't filmed at Tanforan; the distant oil derricks suggest Southern California. ... and Now, the oil derricks appear to be those at Signal Hill, Long Beach, in which case this would be the Los Alamitos race course (map). Here's a recent photo of it below - the derricks were removed long ago when the oil fields dried up. Then ... where they party the night away. ... from the 1950s ... Here's a postcard photo image taken in the Fairmont's Cirque Room at about that same time. ... and Now, the Cirque Room is still there but available only for private parties. This recent photo captured its art deco bar and original circus-themed murals. Lester hears back from his shady lady friend Irene Neves. She has been working on her lawyer boyfriend and found out -"It took five martinis" - that Myra is about to donate the bulk of her fortune to a charity, news that doesn't sit well with the scheming pair.